By the time the month of June arrived, the young eagles were about 2/3 the height of their parents. When they fledged near the end of June, they were as tall as the adults and had the wingspan to match (6 feet or so). At the start of June, the young’s plumage was dark brown, but the next few weeks saw a gradual slight mottling of white. 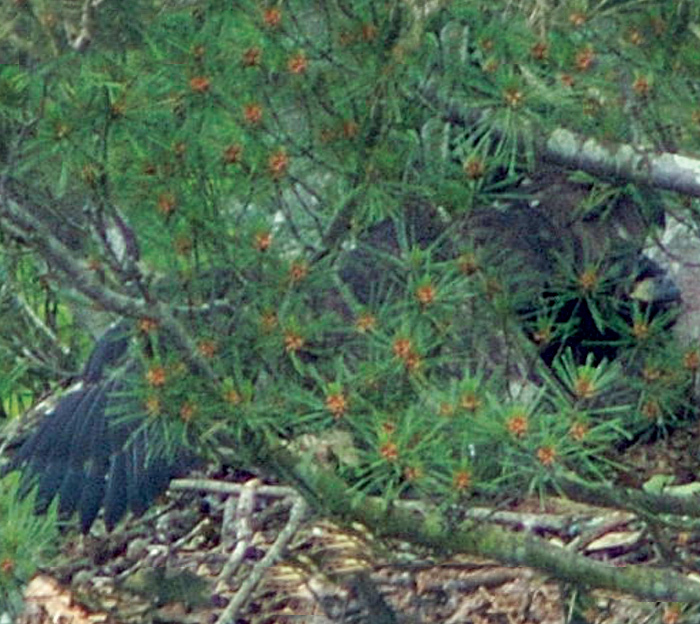 Two young in the nest, with an adult looking on (lower left), June 6, 2004. There are two young in the nest, although one to the left is just a dark shape with no head or beak visible. With the young getting bigger, they take up a lot of room in the nest! During this time, the adults would spend a lot of time perched on nearby branches rather than in the nest. Also, the adults would spend more time away from the nest. With bigger young came bigger appetites, and the adults would spend more time fishing and less time at the nest for protection purposes. 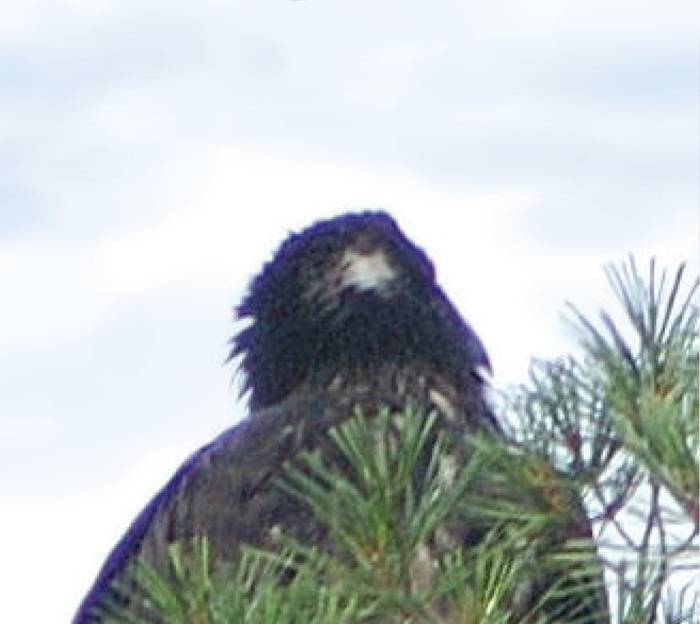 The eaglets were now as big as some of the birds that prey on them when they were first hatched. A new problem came up that the adults had to deal with. With the arrival of late spring and summer came the arrival of hot weather. In the warm weather, both the adults and young were seen panting with their beaks slightly open and tongue just visible. Just like a dog, this helps the eagles cool off by dissipating heat through their mouth. The adults would help the young stay cool by standing with its wings spread slightly and thus shading the young from the hot sun. Feeding time in June saw the adults teaching the young how to deal with food. 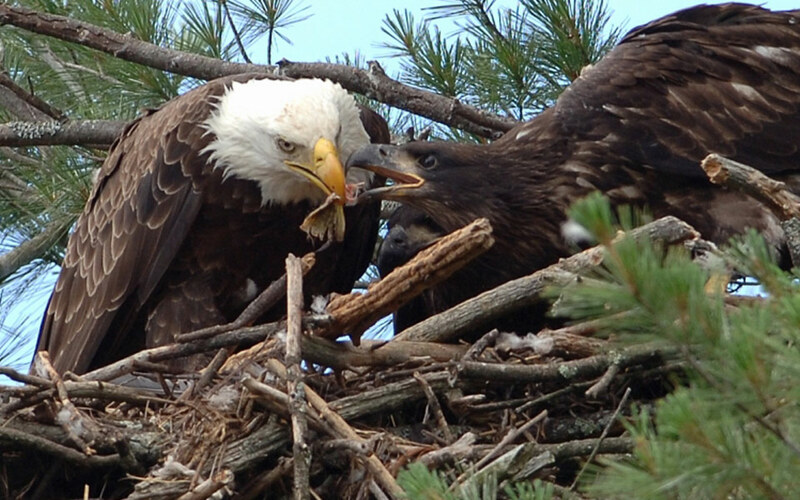 There was less of the adults tearing prey into pieces for the young and more of dropping a prey item into the nest and watching the young try to eat. The above photo shows 1 young with a small eel in its beak with the female observing. This is very important for the young eagles, because they gain experience with prey that they will have to catch even before they can eat! 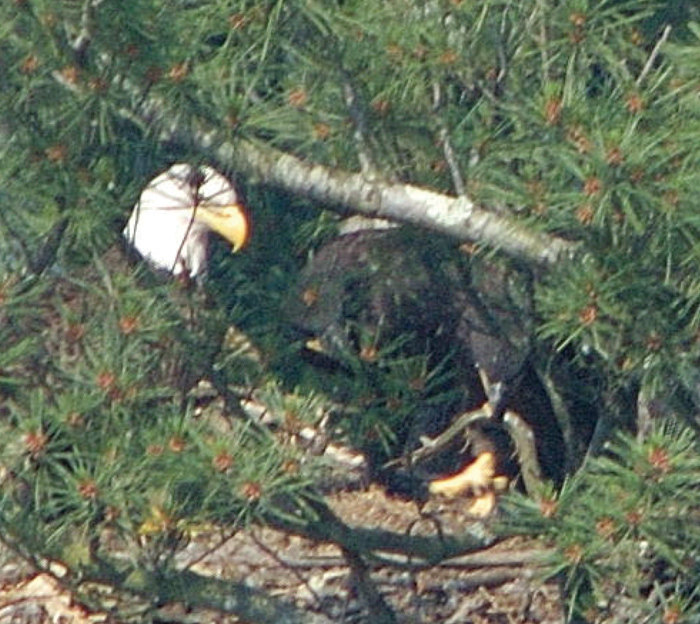 Young with prey item, June 9, 2004. An Eaglet exercising its wings on June 23, 2004. Note the white mottling on the right wing. The most important event of an eaglet’s life during this time is the first flight, or fledging. A Bald Eagle nest is high, sometimes over 100 feet over the ground. If a young eagle suffers a mishap during this time, it can be fatal. There is a lot of preparation for this first flight. The first part of June saw the young moving around the nest; first walking, then running or stomping for a short distance until they ran out of room in the now crowded nest. This strengthens their legs and feet. They need powerful feet and talons to spring into flight, to land on a branch and perch, and to grasp prey and carry it out of the water. The adults will help in this process. On one occasion a few days before the young fledged, an adult arrived at the nest carrying what looked to be a prey item. When the adult dropped it in the nest however, the item turned out to be a sprig of oak leaves. The young, perhaps out of frustration or just playfulness, took turns pouncing on this item and throwing and kicking it around the nest (an eaglet temper tantrum?) Maybe this was a message from the parents that it was time to fledge soon. 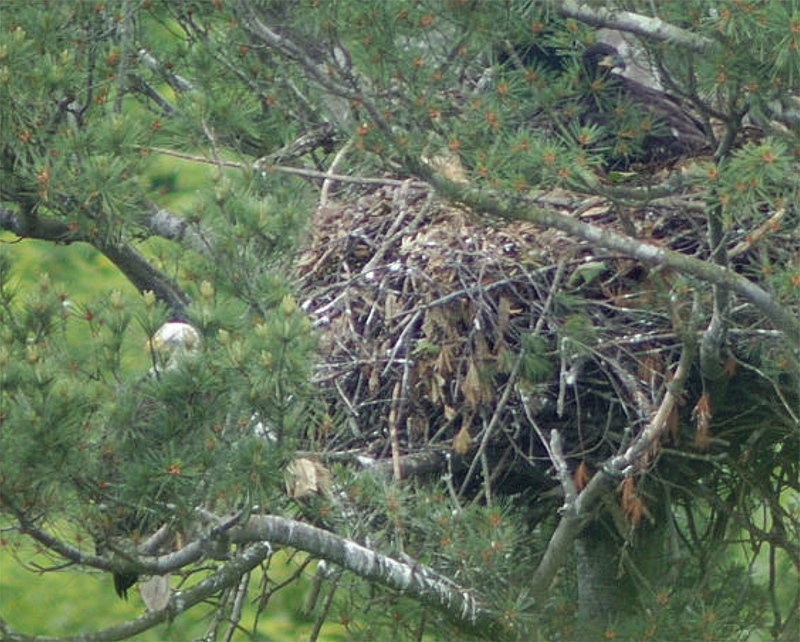 Why do you think Bald Eagle nests are so big? On the 27th of June, one of the young was missing from the nest, and after one of the adults flew and perched at an unusual spot in the middle of the nest tree, I moved downstream from the nest tree and spotted the missing young. The young was perched on a branch very close to the tree trunk, about halfway down the nest tree on the opposite side of the normal observation site. The following day saw this bird on the same branch, but further out and easier to observe. This young did not move too much and its behavior seemed to be very subdued compared to previous observations. I spotted a small white mark on the back of the head, which I had not observed on either young before. Did this bird try to fledge, or just fell out of the nest, and crashed through branches and catch itself in the middle of the nest tree? Did the mark get there when it left the nest, or was it there before and just not noticed? Checking the photos from this nest during May and June did not produce any evidence of a mark. Looking closely at the mark, it was seen as an absence of feathers and white skin, but no bruising that could be seen. Maybe this bird would be OK.
On the following day, this young was missing from the branch, and could not be located, and on the day after, on the 30th of June, the young bird in the nest had vanished and could not be found. During this period, the adults would occasionally fly over the general area, but they did not land anywhere during observation times. That would have possibly helped to locate one or both young. Young with mark on the head, June 28, 2004. Close-up of the mark, June 28, 2004. 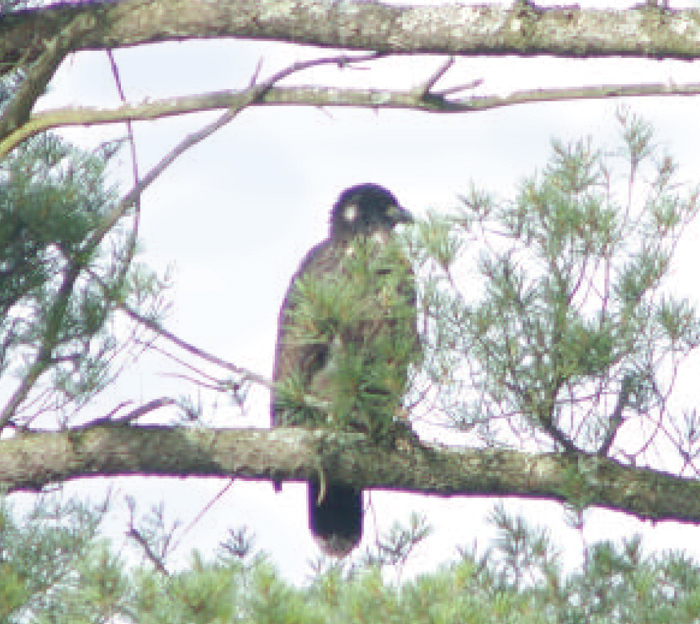 On the 1 of July, both young were observed perched on branches above the nest. The young eagles had successfully fledged. Not having observed either young leave the nest, it was a guess on whether they had been injured or not, but seeing them at the top of that big White Pine answered a lot of questions. They would have had to fly to the top of that tree. The fledgling eagles were spotted a day or so later flying around the nest tree, and it looked like they were rapidly gaining their flying skills. 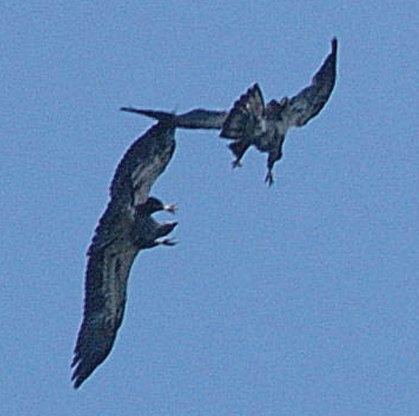 The below photo shows the fledglings engaging in mock combat. They do not make contact, and probably do this for play. They perched in the same tree right after this. For the first week or two, they were seen frequently in or near the nest when they were not flying or somewhere else. After the first month though, they were rarely seen near the nest. Instead, they were spotted on perches that were also favorite perches of the adults. Sometimes the adults would be in the same tree or nearby, possibly looking for prey to show the young birds how to successfully hunt. They need to learn this skill soon; the parents will still supply food at first, but the free meals will stop with time. By the end of the summer, the youngsters will have to fend for themselves. After mid August, the young were rarely seen, finally disappearing altogether by September. This summer, the New York Dept. of Environmental Conservation radio tagged 2 young from separate nests during the annual nest survey. It was found that both these birds headed down south to the Chesapeake area, in some of the tributary regions. The small radio transmitters fall off after 6 months or so maybe we can see where they go in the spring! Maybe our young joined them for the winter. These young eagles have a challenge ahead of them. The first winter is especially rough for young eagles. If they survive however, they will keep their brown plumage for 5 years. The mottling and color will change somewhat during the first 5 years. At about 5 years of age, the immature eagles become adults, and they gain their white heads and tails for which the Bald Eagle is famous. At this time they also be able to breed. They will seek to take a mate, and build a nest. Typically, they will build a nest within 100 miles or so of where they hatched, and frequently, they nest a lot closer. With a little luck, these 2 young will be around the area in a few years contributing to the comeback of the Bald Eagle! Adding to the population. Eagles mate for life, using the same nest or nest area each year. The female will lay 1-3 eggs; several breeding pairs in this region successfully raise 2-3 young each year. The young will remain on the nest for about three months. By July most are able to fledge or leave the nest. Many stay in the region, as long as the food supply can support them.